On February 3rd, the champions of Super Bowl LIII will be determined and will earn their place in history. And whether or not you’re a diehard football fan, the Super Bowl is a must-see sporting event each year. Where will you watch the Super Bowl this year? Hopefully, you’re already planning to join us at The Still. The Still isn’t your typical sports bar. In fact, it’s the best place to watch the Super Bowl for many reasons. 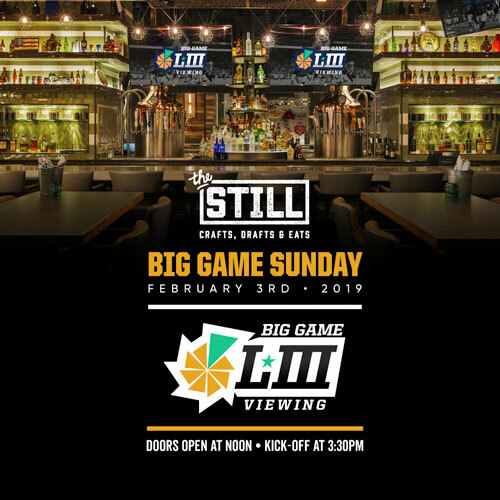 The big game requires big drinks, and we have the motherload of big drinks here at The Still. When it comes to big drinks, our largest is our signature Hail Mary Bloody Mary. This isn’t your typical Bloody Mary – not by a mile. This drink measures a full liter in size, meaning it will last you for most of the game, or you can share it with friends. But we’re also all about quality here at The Still, and the Hail Mary Bloody Mary doesn’t disappoint. We use our own secret recipe and hearty mix featuring the perfect blend of spices. This drink is just as good as it is impressive. A drink as big and imposing as this one deserves more than a celery garnish, so we’ve added tons of extra fixings making the Hail Mary Bloody Mary more like a meal than just a drink. Garnishes include a cheeseburger, chicken wings, a Slim Jim, and a grilled cheese sandwich. In short, you get everything you need to enjoy the big game, all in one amazing drink. Plus, did we mention the attention that you’ll get from other football fans when you order and then polish off this impressive drink? A football team will earn the title of Super Bowl Champions, but you’ll be a champion in your own right for taking on this Bloody Mary. Want to make your Super Bowl viewing experience truly memorable? Then reserve our Man Cave for your own private viewing party. The Man Cave seats up to 14 people, so you and your friends will have a great time watching the game on our giant wall of TVs. You’ll enjoy great food and drinks in your own special space – this is perfect if you want to have a Super Bowl party but your home isn’t quite large enough for all of your buddies. Bring all of your friends to watch the Super Bowl at The Still – we’ll have a party platter of football food that’s right for you. Our Small Platter served 4-6 people and costs $300. It includes Salsa & Chips, Guacamole & Chips, a small bucket of Wings, BBQ Chicken Quesadillas, Mini Cheesebugers, and a Bucket of Fries. It has all of the great game food you want at an unbeatable price. For a larger group, our Medium Platter serves 8-12 people and costs $500. 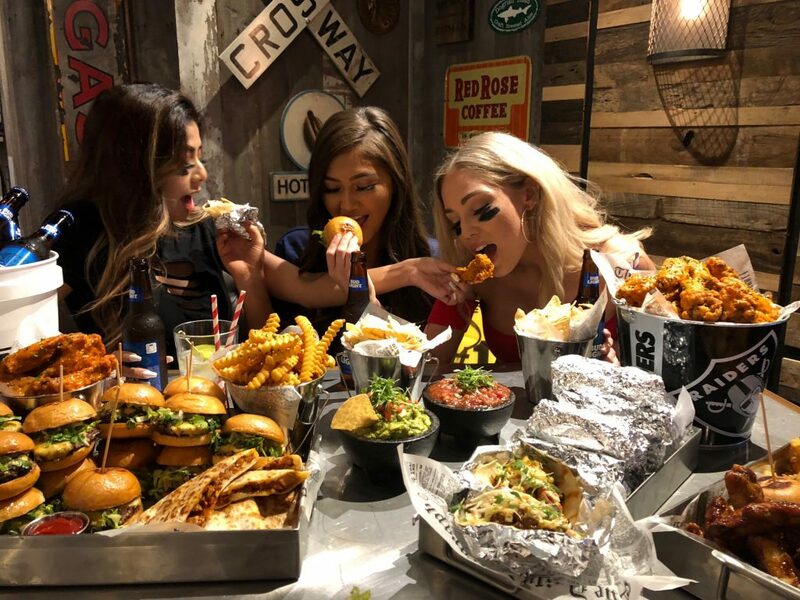 It includes all of the offerings of the small platter, PLUS comes with Al Pastor Chicken Tacos, Marinated Steak Tacos, and a medium bucket of wings. For 14-18 people, our Large Platter is the best choice. It costs $700. The large platter includes everything in the small and medium platters, plus it comes with a large bucket of wings. The Still offers 8,000 square feet of space and an incredible 27 TVs. This means that there isn’t a bad seat in the house, and everyone will have a great view of all the action. Catch that game-changing touchdown and be able to say that you witnessed sports history in the best Las Vegas sports bar. At The Still, we have 50 beers and the best craft cocktails in town. This means that everyone will get their favorite drink, or 5! We recommend the Raging Bull to get yourself fired up for the game – the blend of Grey Goose Vodka, tropical citrus juice blend, and Red Bull Orange Edition will give you the energy you need to cheer your team on through all four quarters. Kick off the game with your favorite beer, try some of our cocktails, and celebrate the victory with a round for your group. Ready to make Super Bowl LIII one to remember? Then join us at The Still to watch the big game, enjoy some amazing food and drinks, and celebrate the victory with other football fans.